Those who use infinite scrolling on their websites do so because they believe that it can provide a better user experience. On mobile devices, infinite scrolling is really helpful as the act of scrolling is easier than zooming in just the hit the button that will take you to the next page. Infinite Scroll gives you an alternative to this by allowing users to view an endless number of posts on your site. Here, in our today’s post we have compiled a list of some of the amazing WordPress free infinite scroll plugins for your wordpress blogs. You may be interested in the following modern trends related articles as well: Free Multilingual Widgets for WordPress, Premium WordPress Responsive Corporate Themes, Best Free Eye Brushes for Photoshop and Free WordPress Themes with Featured Images. EasyScroll is the answer to your question, “How can my site be awesome?”. This plugin will add a sense of fluidity and interactivity to your site, causing your viewers to stay longer, read more posts, and probably buy you a Ferrari. EasyScroll is simple, really. All it does is add a “lazy load” of posts, pages, or any custom post type to your site, wherever you want. Timeline express allows you to create a vertical animated timeline of announcement posts , without writing a single line of code. You simply create the ‘announcement’ posts, set the announcement date and publish. The timeline will populate automatically in chronological order, based on the announcement date. WPFront Scroll Top plugin allows the visitor to easily scroll back to the top of the page, with fully customizable options and image. WPFront Scroll Top plugin has the following features. Displays a button when user scrolls down the page. Scrolls the page back to top with animation. Create text or image button. Hide on small devices. Vertical scroll recent post plugin scroll the recent post title in the widget, the post scroll from bottom to top vertically. This is the best and fashionable way to show all the latest post to user. No coding language knowledge required to setup this plugin. One click add Infinite Scroll to Twenty Fifteen theme with animation effect. Just activate the plugin to add Infinite Scroll on Twenty Fifteen theme. Automatically animation effect. Change text messages easily. RTL Support. Ajax Load More is a simple yet powerful solution for lazy loading WordPress posts and pages with Ajax. Build complex WordPress queries using our shortcode builder then add the shortcode to your pages via the content editor or directly into your template files. 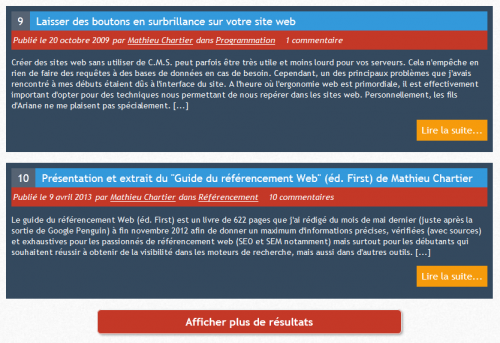 WP-Advanced-Search est un moteur de recherche complete et puissant pour WordPress entierement module. Using a relevance algorithm for the final classification. Autocomplete option and automatic addition of words in the index. Ability to write an exact search with words in quotation marks. 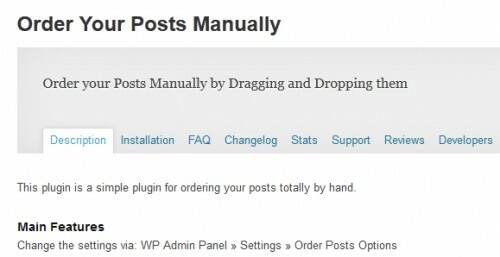 This plugin is a simple plugin for ordering your posts totally by hand. Change the settings via: WP Admin Panel » Settings » Order Posts Options. Start the plugin via: WP Admin Panel » Tools » Order Posts Manually. Drag and drop your posts in the order you like.